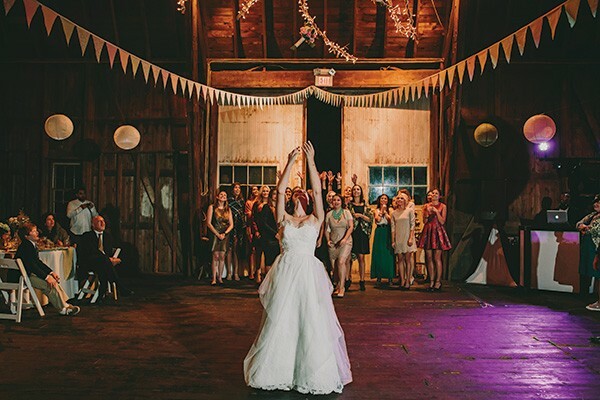 Claire throws her bouquet during her wedding reception at Tralee Farm in Stone Ridge. We'll be the first to admit: There's something so romantic about saying your "I Dos" in a rustic barn. Luckily upstate New York is teeming with them. Just picture it—the exposed wooden rafters, the effortless lighting peeking through the wooden slats, that rich, old musky smell that you couldn't re-create if you tried—it's all there. But there's plenty that goes into making all that romance and beauty come to life. Sure, a lot of it is built-in charm that you get just by signing a venue contract, but there's plenty that goes on behind the scenes, much like with a more traditional wedding venue (we're looking at you, ballrooms and banquet halls). From a few of our favorite spots in the Hudson Valley, to the dos and don'ts of making your big day perfect, here's everything you need to know before you book that barn. Planners always say picking the venue is one of the toughest parts, if not the toughest part, of wedding planning. And they're right! After you've chosen your location, a lot of your style aesthetic falls into place: You're not going to have a rustic ballroom wedding (we'd love to see that!) or a gothic English garden affair. 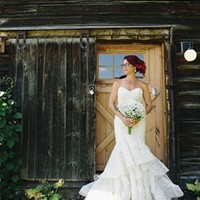 But maybe that's why brides have fallen in love with barn weddings—you can go as rustic or as elegant as you want, says Karin Hlywiak, owner and lead wedding coordinator for Cinderella for a Day, based in Kingston. Barns allow couples a tremendous amount of room for customization. Favor a backyard barbecue over a full sit-down dinner? Either will work in a barn venue. Or, maybe your guests don't want to leave after the music shuts down—you can have a bonfire in the back and roast marshmallows over the fire. Hlywiak has even arranged an outdoor lounge area, complete with a projector screen to re-create the vibe of a drive-in theater. Guests relaxed and watched a movie late into the night. 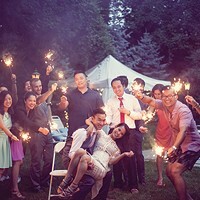 But our favorite part about barn weddings? While some barns feature antique cars or tractors as charming décor, you don't have to worry about kicking over a precious piece of art like at a museum venue or scratching up the parquet or marble floors in a ballroom. Daniel Giessinger, co-owner of Shadow Lawn in High Falls, says, "Guests relax and have fun—the setting shakes off a formality that people expect at a wedding, and that makes for a great party." Your Guest List: Barns aren't always built to accommodate a big number of people. The average barn can usually hold around 150 guests, but that number can go up to over 300 and down to below 100. For instance, the barn at Stone Tavern Farm in Roxbury can hold up to 400 people. For a more intimate affair, Tralee Farm in Stone Ridge can only hold up to 175 people in their barn. Of course, some smaller barns could probably seat more guests if you really tried, but you don't want people to feel uncomfortable, and you also have to worry about safety regulations. Plus, you can't forget about where the band or DJ will be stationed and where people can dance. Stone Tavern's barn has a built-in stage for your band and plenty of space for dancing. Tralee Farm has an incredible eight-foot-tall apple tree hanging from the ceiling that is commonly strung with twinkle lights for a striking décor piece over the dance floor. If you're having a destination wedding, you also have to think about where all your wedding guests will be staying, and how they are getting to the wedding venue. Because your venue is a barn, chances are, it's not near many big hotels. Luckily, some barns, like Apple Barn Farm in Livingston, have on-site housing where you can rent out cabins for the weekend. Ask your venue for nearby lodging suggestions—bed-and-breakfasts are a great way to keep your business local and help support the economy. If many people are staying off-site, also consider transportation. It's always nice to offer busing to and from a common place, which can cut down on overcrowding and confusion at the venue if there isn't enough parking to accommodate all your guests the day of.